Many people are concerned about the possibility of counterfeiting, both our branded cards and similar laminated cards as well as other alternative currencies. Hopefully this guide will help explain why it isn't as big an issue as people think, as well as help educate more generally on the topic of counterfeiting. For a decent background and some interesting history, Wikipedia does a reasonable job. It might be helpful to read their article if you aren't very familiar with the subject. 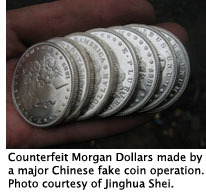 There's also an article on counterfeiting coins that might be worth a read. HowStuffWorks has an interesting article on counterfeiting U.S. currency that can be a good read as well. Here's a short video that introduces the sound test that can be used on some coins and bullion. But even though it is wise to be cautious when accepting any currency, there are some good reasons to not worry too much. Counterfeiters try to make maximum profits with minimum work. In order to do that they need to counterfeit products that can provide more income than it costs to make - significantly more due to the increased risks involved. They are also looking for something that will bring in more than they could make in a regular job. So they typically counterfeit larger denominations, such as $100 bills. 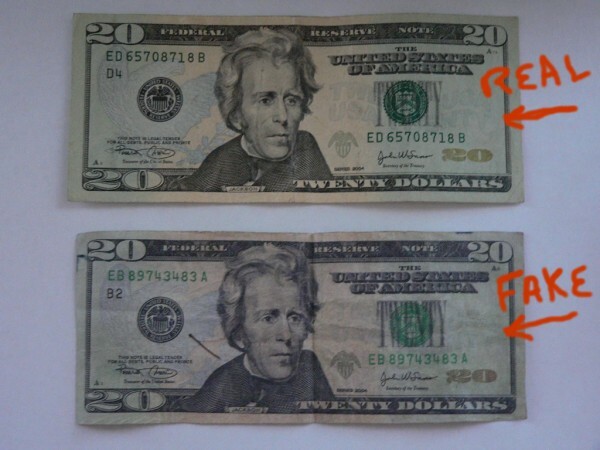 Often they weigh out the risks and choose to try counterfeiting bills that are more typically used, such as $20, but they almost never bother counterfeiting $5 bills. When it comes to bullion or coins, most counterfeits are in the larger sizes. Just like with bills, there's a good reason for this. The overhead of counterfeiting one unit doesn't change much when the denomination changes. That is, it costs about the same to counterfeit a $1 as it does a $50. Since the profit would be larger when you counterfeit a larger denomination, that's what they typically do. In addition, there usually are somewhat large fixed costs. While these have been coming down over the years as technology has improved, there will still need to be some capital outlay up front. For example, a die set for stamping a coin can cost as much as $1,000 and will certainly be at least $500 - and that doesn't include the cost of a press to do the stamping. The fixed costs need to be ammortized across all the units produced, so in order to make a profit a lot of fakes need to be made. What it all comes down to is the economics of counterfeiting leads to large production runs of medium or high denominations. Shire Silver's denominations are mostly smaller than is practical to counterfeit. And while we hope it doesn't remain so, currently the market for Shire Silver cards is small enough that a large enough batch of cards to make a profit wouldn't be able to be absorbed - thus any faked cards are doomed to sit there in the counterfeiter's inventory. Where can I spend or sell the fakes? How hard is it to make the fakes? How much will the fakes cost to produce? How much profit can be made on each unit? How many uunits will need to be made to break even? How many to make a desired amount of profit? How safe is it to spend them? There's a lot of thought that needs to go into even deciding what to counterfeit. We've done a lot of thinking about it, trying to see it from a counterfeiter's point of view, and we don't see why they would even seriously consider counterfeiting Shire Silver cards when there are cheaper, easier, and safer things to fake. Government bills typically have a handful of "security features" in them. This is because they're essentially just ink on paper, and inherently easy to copy. But any measures taken must be cost effective and consistent. So there's always a sort of race between counterfeiters and bill security designers. But if new features get introduced too rapidly, the public can't keep up, so the counterfeiters are usually on the winning side - at least against governments. For coins and bullion its a little different. Sizes and weights are well known, and this makes it a little harder to make passable fakes. But even weight and volume tests for density will only give you a certain level of confidence. For real assurance, you need to do destructive testing. Planchets of the right density can be constructed and plated to look like whatever coin it is being counterfeited, so to be sure you need to test inside the core of the coin as well as the outside. This is one area where Shire Silver does well. The plastic and paper can be burned off, leaving behind just the metal. The metal can be easily tested at almost any jewelry store using an acid test. And since the denominations are all small, testing a card every now and then just for some assurance isn't a big deal. But all that being said, most people are good and there's a lot of trust. People using alternatives like Shire Silver are usually dealing with people they know. In my over a dozen years dealing in the precious metals world I've only ever seen one person go so far as to weigh coins being used in a transaction. Sure, a lot of folks have a good appreciation for the heft of an ounce of silver and a quick visual inspection is sometimes hidden behind a bit of chatter like "that's a pretty one". But in most cases, people trust their trading partners. So in most cases if someone you are trading with hands you a counterfeit, its because they were fooled before you. They'll likely try to make good. A cynical person would note that if its good enough that your current trading partner didn't catch it, your next one won't either. So it can get passed on like a hot potato but at least serving its purpose as a medium of exchange, if not as a store of value.